MATLAMAT ANGGUN SDN. BHD. was incorporated in 18th July 1995 and was taken over by the present Board of Director in 2001. In the early days of business, it is more focus on general trading and in 2001, it starts actively in trading of building materials, specialized building materials such as construction chemicals and taking up project contracts such as waterproofing system, concrete repair, flooring system and other related works. In 2014, we have venture into main contracting work for light industry factory. The key personnel within the company has a wealth of experience and expertise in all the important area of trading & contracting procedures, operation management and also quality control of material sold and materials used in contracts taken up. We are steadfast in our quest to satisfy our valuable customer by providing professional advice in waterproofing works and products of the highest quality in a convenient and environmentally friendly manner. We strongly believe that the key to success is through the empowerment of our team members to focus on value-added activities. Our hallmark will be service through the initiative, innovation, dedication, teamwork and professionalism of our highly trained personnel. Customer focus and quality in delivering of product and workmanship will be our constant obsessions. MATLAMAT ANGGUN SDN. BHD. offers our valuable customer the one- stop centre for variables specialized building materials, construction chemicals that are used in the construction industry. Our next main business is to provide services for concrete repair, structural repair, and strenghthening works. Flooring system is another category that we are specialized in, in which we undertake contract for floor coating, epoxy flooring and power float with floor hardener works. Apart from that, we also provide supply/supply and lay/provide design advise for GEOSYNTHETIC products, i.e, geoxtextile, geogrid, geosynthetic clay liner, gabions, sub-soil drainage system. 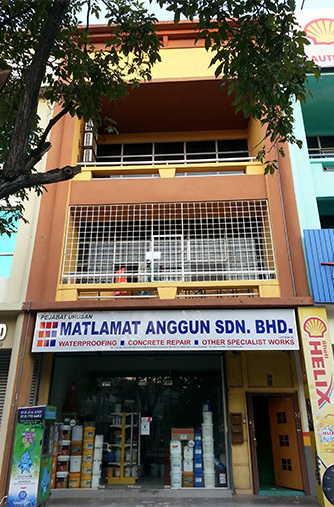 8B, Jalan Sepadu D25/D, Taman Perindustrian Axis, Seksyen 25, 40400 Shah Alam, Selangor, Malaysia.